the mummy, the photographer & the wife: Win a WowART lesson this holiday for your child! 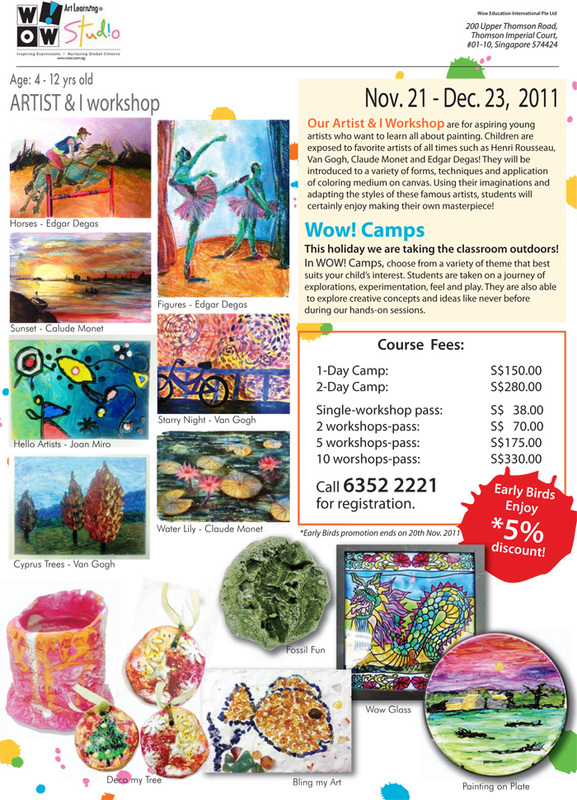 Your budding little artist at home will be thrilled to know that WowArt Learning Studio is having a holiday program this coming year end school holidays. During the September holiday, they offered art workshops only but this time, they will be taking the classroom outdoors and offering WOW Camps! Students will be able to explore, experiment, feel and play in these hands-on sessions. In the Artist & I workshops, your child will be exposed to great artists of all times such as Henri Rousseau, Van Gogh, Claude Monet and Edgar Degas through painting on canvas. To know more about WowArt, do visit their website or read my boys' experience with them here and here. Done for 1 & 2:). I can be reached at khor.pc@gmail.com. Thanks for the chance. hi you two, thanks for taking part! there was another person who sent me details via FB but did not post a comment here. anyway i used random.org and key in min 1 and max 3 and the result and winner for this giveaway is #1! congrats JWZT! hope your child enjoys his art lesson at WowART! let me know how it goes :) will be in touch soon!